AI Robot automates repetitive tasks quickly and simply. We all control our computer using mouse and keyboard. All our input comes from mouse movement, mouse clicks and keyboard key presses. 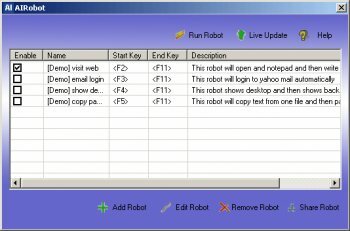 This helps you automate mouse movement, mouse click and keyboard key presses. So you just need to tell it what to do step by step, then AI Robot will run all these steps automatically, and repetitively.